Alyson considers herself, first and foremost, a student and recognizes all beings and nature as her teachers. She is empowered by the community that yoga supports and by her ability to grow and refine all aspects of her life with love and compassion through dedicated practice. Alyson's objective is to promote health and happiness by creating a safe space that encourages students to find their inner source of power and abundance. Her classes are playful, intelligently sequenced, and alignment focused. Every class holds the intention of guiding students on their individual physical and energetic journeys to promote exploration and self-awareness on and off of the mat. 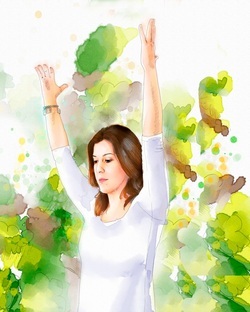 Alyson has been practicing yoga, pranayama, and meditation since 2005. She received her Yoga Alliance registered teaching certification through Frog Lotus International in 2011 and completed an anatomy intensive through Zenyasa New York - Anatomy Studies for Yoga Teachers in 2012. Alyson graduated from James Madison University in 2007 with a degree in Business Management and a minor in the Music Industry. Kerry is the Founder of Yoga and Work and also serves as the Director of Human Resources and Operations for Actualize Consulting in which she spear headed and runs a successful wellness program.